Mint in the box with papers shown. Great addition to your diecast collection. 1955 Bentley S. Brochure For Color Brochure (Folds out to 11.5" X 19.5"). Franklin Mint. cars and trucks from various manufacturers. 1:43 scale. and trucks from various manufacturers. 1:18 scale. 1955 Bentley S. There is detail that makes this look like the real car! This is in the original styrofoam form and box but no paperwork. It suits this posh Bentley very well. The tan/beige interior is also gorgeous and well done. The doors fit better than most and the two tone line is sharp. 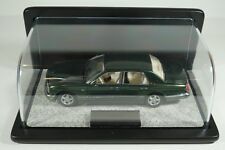 Bentley Arnage Green Label. 1/24 scale. 1998 Bentley Arnage (Car not included). Brochure For One-Sided Color Brochure which folds out to 8" X 10.75" (Just pictures). Franklin Mint. cars and trucks from various manufacturers. 1:43 scale. and trucks from various manufacturers. FRANKLIN MINT PARTIAL PAPERWORK SET - 1929 BENTLEY 4.5 LITRE "BLOWER"
1929 Bentley 4.5 Litre "Blower" (Car not included). Franklin Mint. Paperwork For 1:24 scale diecast cars and trucks, paperwork and brochures. Handling & Care Instructions. and trucks. Includes the following. Used in styrofoam packaging, only opened for photos. Car is in great condition, with back muffler broken (see photos). COA included. Due to the long shelf time of our items, we cannot guarantee that they are in mint or perfect condition. Items are “as is” when received. Please thoroughly check photos. We are happy to send additional photos upon request. 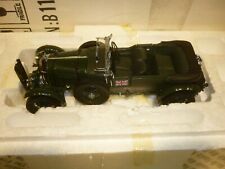 this is new in box 1955 Bentley s. It is a model scale 1/24. Please message me with any questions or concerns you may have. Everything you see in the photos is what you will receive. 1955 Bentley S (Car not included). Franklin Mint. Partial Paperwork For 1:24 scale diecast cars and trucks, paperwork and brochures. Color Brochure (Folds out to 11.5" X 19.5") Lot and trucks. Includes the following. This is not a picture of this actual item is it a photo from worthpoint for reference. mine is not yet opened. The Mascot is still on the grill. the roof aerial needs fixing back on. ( always normally missing ). sent second class, sign for. scale is 1/24. Well detailed, opening bonnet with detailed engine, front wheels steer and roll. 1:24th scale model by the Franklin Mint of a 1929 Bentley Blower in racing green. Issues - wheel mudcover off as shown, mirrors missing needs TLC as shown.